The theme zip file thimpress_resca_unzipme.zip. – Then go to Appearance >> Widget >> Footer Bottom >> Edit Text widget >> copy shortcode of MailChimp form created above to replace shortcode content >> click “save” to get the change. – Edit Home pages >> Edit Revolution Slider >> select a slider for pages and configure “Home Page” Template for pages. There is a “demodata.xml” file placed in folder resca\inc\admin\data, just find this file for importing demo. – select a static page (select below) >> Choose Front page is whatever Home page you want. Click “Browse” >> choose file themes\resca\inc\admin\data\revslider >> select one file zip revolution slider >> Click “Import Slider” button to start importing the slider. – Go to Tool >> Widget Setting Imports >> Select a file >> Choose file themes\resca\inc\admin\data\widget\widget_data.json >> Click on “Show Widget Settings” >> Select all active widget >> Click on “Import Widget Setting“. Then go to Appearance >> Widget >> Footer Bottom >> Edit Text widget >> copy shortcode of MailChimp form created above to replace shortcode content >> click “save” to get the change. 8. 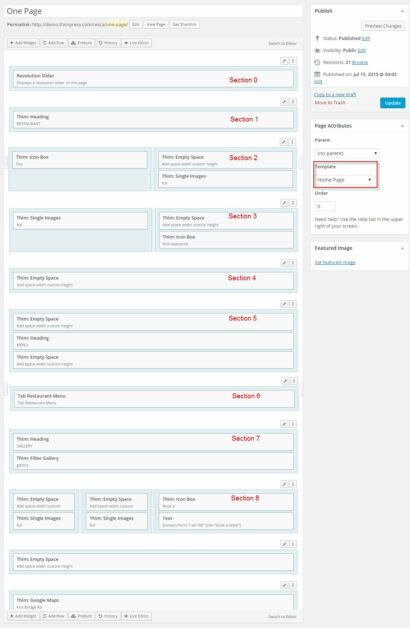 Edit Home pages >> Edit Revolution Slider >> select a slider for pages and configure “Home Page” Template for pages. – Drawer Style: Currently there are 2 styles of Drawer Style for you to choose. – Select a Layout: there are 2 style for header main menu. – Header Position: select type Header Position for main menu. – Background color: select color for background main menu. – Text color: select color for text of main menu. – Text Hover color: select color for text when hover over main menu. – Font Size: select font size for text main menu. – Font Weight: select font weight for main menu text. – Color Border Top: select color for border top of sub menu. – Background Color: select color for background of sub menu. – Color Border Bottom: select color for border bottom of sub menu. – Text color: select color for text of sub menu. – Text color hover: select color when hover over text sub menu. – Config Sticky Menu: you can choose “custom” or let it “same with main menu” when sticky menu. – Sticky Background color: If custom sticky menu, select background color for main menu when sticky. – Text color: If custom sticky menu, select text color for main menu when sticky. – Text Hover color: If custom sticky menu, select text hover color for main menu when sticky. – Background color: select background color for main menu when view on mobile. – Text color: select text color for main menu when view on mobile. – Text Hover color: select text hover color for main menu when view on mobile. – Icon: enter icon name. – Background footer image: upload background image for footer. – Text Color: select color for text in footer. For more understanding on configuration of footer, you can go straight ahead to section SETUP FOOTER. -Body Background Color : this option should only be used with the Boxed Layout. You can select a solid color for the background of your page. -Theme Primary Color : Each of our theme will have one major color called “Theme primary color”. The elements of the primary color are included with: Hover Text color of “Book a Table”, color of “View Detail” button, color of text “Book Menu” button, hover social link icon… If you configure any color, it also will be applied similarly to these elements. – Background Heading Color : Select Background Heading color for front page. – Text Color Heading : text color heading in Front page. – Select Layout Default: select style default layout for front page. – Background Heading Color : select color for Background heading of Archive page. – Text Color Heading : text color heading in archive page. – Show category , Date, Author , Comment of posts in archive and front page. You can configure for another posts and pages in this place. All options is same with Archive page above. You can input information, background top heading color or top image for pages not found without install plugins. – Sub Tittle: enter sub tittle for Shop page. How to Add “Custom Menu” Widget for one “Copyright” Widget Area? Definite page id and sections id of this onepage by editing this onepage and you can see id page in this link. (Example: in this link http://demo.thimpress.com/resca/wp-admin/post.php?post=1832&action=edit, id page of our one-page is “1832”). Each rows of page is a section id. Edit One-page created on step 1 >> select “Menu Onepage” on “Select Menu One Page” box >> click “update” to get the changes. Go to Dashboard >> Setting >> Reading >> Front page displays >> A static page >> select Front page is created onepage above >> click “Save Changes”. 1. Go to Appearance -> Customize –> Header and configure the options for header. Using “Thim Event” widgets to show posts. How to use this element? 2. Using “Thim Filter Gallery” widgets to show posts. How to create Gallery page? – Create Posts: Go to Posts >> Add New >> select Format is “Gallery” >> select Categories is “Gallery” >> Set “Featured Image” for post >> upload gallery image in “Post Format: Gallery” section >> click “update” to get the changes. Using Thim Filter Gallery widget to create Gallery page: Go to Pages >> Add New >> add Thim Filter Gallery widget into content of page >> Edit Thim Filter Gallery widget >> Select Category is “Category” >> click “save” and “update” page. Create a New page : Go to Pages >> Add New >> Display Setting >> Select layout for page >> click “update“.